Vacations could turn out to be a great experience if you plan a kayaking trip in it. Kayaking tours allow holidaymakers to enjoy good food, good company and the full glory of nature’s brilliance while on vacation. According to Crystal Seas, there are several reasons for which kayaking should not be missed. Kayaking is a full body workout, and it’ll leave adventurers ready for a hearty meal by the end. The tourists can go up to a few hours trip along with an experienced guide and have the time of their life. Moreover, kayaking provides the tourists the best opportunity to connect with nature. They will not be disappointed by the many sights that await them. Apart from that, the tourists are offered snorkeling and will get plenty of time to explore the turquoise depths in between bouts of kayaking. Sea Kayaking is a fun-filled activity not only for children but also for adults. It brings the family together through the shared experience of physical exertion and adventure. 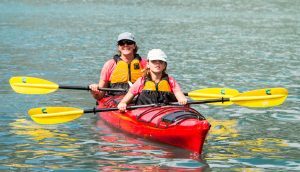 Families can have an unforgettable kayaking experience. It also teaches people team work and instills team spirit. Kayaking is great for the overall health of the body and the mind, as it brings increased clarity and mental relaxation. Paddling is known to reduce stress and improve overall emotional wellness. All these factors make kayaking a perfect activity to be planned on your vacations. Make sure to book a kayaking trip on your next family vacations.